The Buddhists are said to believe in the existence of a subterranean world called Agharta, where a great civilization, many thousands of years old, lives in peace and harmony under the leadership of a supreme ruler known in the Orient as the King of the World. It is said there are many cities in Agharta, all connected by a complex network of tunnels with high-speed vehicles that allow the occupants to speed from place to place, even under the oceans. The capital of Agharta is Shamballah, which is connected by an entrance to Tibet and the Dalai Lama. The civilization of Agharta is believed to be a direct line of descendants from Atlanta. These people once also occupied a large part of South America, which accounts for the spectacular and ancient ruins found in the mountains at altitudes impossible for contemporary humans to live. 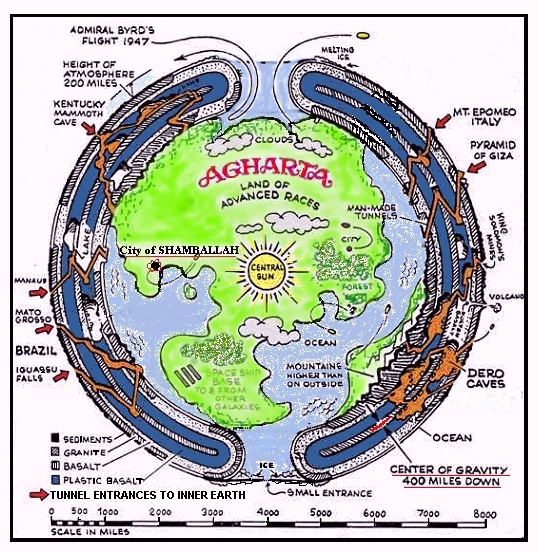 Hollow earth enthusiast, the late Dr. R. W. Bernard, once proclaimed in one of his articles that "during various epochs in history, the Aghartan supermen or gods came to the surface to teach the human race to save it from wars, catastrophies and destruction. The coming of the flying saucers soon after the first atomic explosion in Hiroshima represents another such visitation." Bernard suggests that such ancient historical emissaries as Rama, as told in the Indian epic Ramayana; Quetzalcoatl, who impacted the Mayan and Aztec cultures; Manci Copac, founder of the Inca dynasty and the Buddha all came from Agharta. "It is claimed that the earth's crust is honeycombed by a network of tunnels passing under the ocean from continent to cntinent and leading to subterranean cities in large cavities in the earth," Bernard wrote. "These tunnels are especially abundant in South America, especially under Brazil, which was the chilef center of Atlantean colonization; and we may believe they were constructed by the Atlanteans. Most famous of these tunnels is the 'Roadway of the Incas' which stretches for several hundred miles south of Lima, Peru, and passes under Cuzco, Tiahuanaco and Three Peaks, proceeding to the Atacambo Desert. Another branch opens in Arica, Chile, visited by Madame Blavatsky." Russian explorer and author Ferdinand Ossendowski, in his book "Beasts, Men and Gods," also tells of these subterranean tunnels that exist throughout the world. He said they were constructed by a prehisoric race. He said there are two subterranean worlds, one relatively superficial and the other in the center of the earth. Why would the ancients construct such an elaborate network of tunnels and cities deep under the surface? Harold Wilkins, a South American archaeologists, suggests that they were built to escape a looming nuclear war and radioactive fallout. These are very ancient stories . . . mostly mythology . . . that have found their way into published books. The story of the strange flight by Admiral Byrd into a massive opening at the North Pole helps support such tales. But can we believe that an advanced civilization truly exists right under our feet? Consider the fact that massive tunnel boring machines have been built and used to build a complex of contemporary tunnels under the United States and possibly Russia. There are stories that entire cities have been prepared in key locations deep underground to house key personnel in the event of nuclear war or some other catastrophic event. The technology clearly exists today to build such tunnels and underground cities. Why should be say that ancient civilizations could not have done the same . . . and do it at an even grander scale?